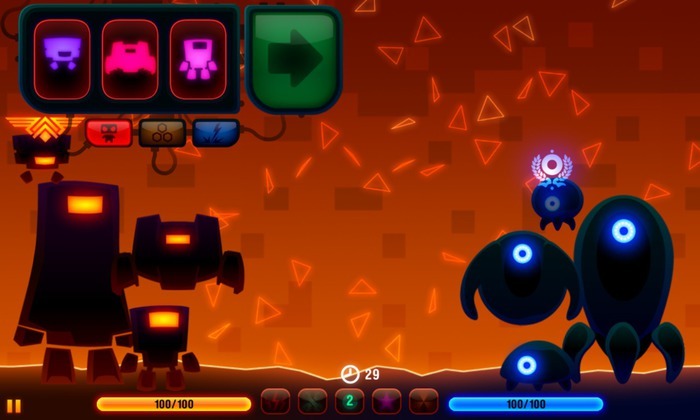 Robotek is an unlikely mix of cuteness, post-apocalyptic futures and fruit machine gameplay. See, told you it was unlikely. Not only that though, it throws in a dash of strategy too, forcing you to use your grey matter rather than just how well you can time stopping the spinning symbols to activate your various activities. 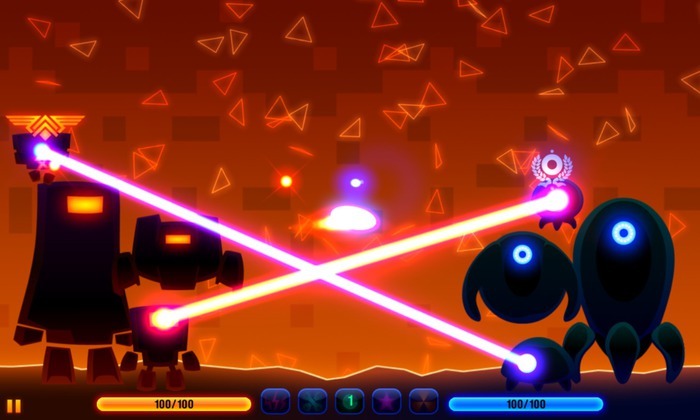 Besides the fun factor of Robotek, it's also a title that shows signs of the future of the Windows Phone ecosystem, as this game was recently released on Windows 8 and Windows Phone 8, which, of course, is the promise of the common kernel between Microsoft's desktop and mobile operating systems. Robotek has a pretty flimsy story line, which is fine as the game needs little justification, it's just fun. For the record though, it's set in the future where artificial intelligence has taken over the planet, but fortunately you have an army of robots at your disposal to fight for the humans. Your battlefields are infected mainframes across the world, which you have to reclaim one at a time. Tackling each mainframe requires a certain number of energy points, the higher the difficulty the greater the energy demand. Every win earns you experience points, but there's no guarantee you'll win, which is another echo of gambling that complements the fruit machine type game play mentioned above, which we'll talk about below. Taking on a mainframe that's tougher than you are and winning gives you even bigger experience point rewards. As you win more mainframes, you'll be awarded more health points, which will be crucial to your ability to survive battle with tougher mainframes. That covers the meta-game which the core game is wrapped in, now on to the core game. When you go into battle you'll find two giant robots facing off – you're the red one, and your opponent is the blue one. Above each is a futuristic, fruit machine like device with three columns, on which there are three modes, each has a different set of icons. The first mode is for deploying smaller robots around your main robot, these will lend extra firepower and provide extra targets to get hit instead of you when you enemy shoots back. You can have a droid, a drone, or a tank. 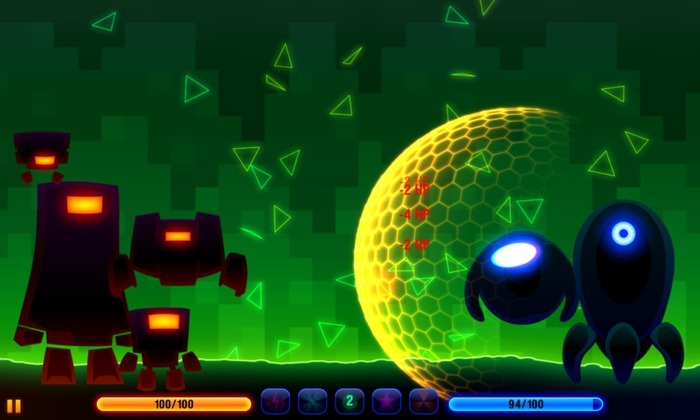 The second mode is a set of special abilities: Firewall provides a protective shell around you and your team of robots, Hack gives you the chance of capturing one of your opponent's robots and turning it against its own team, and Drain allows you to steal health points from your opponents and apply them to you and your robots. 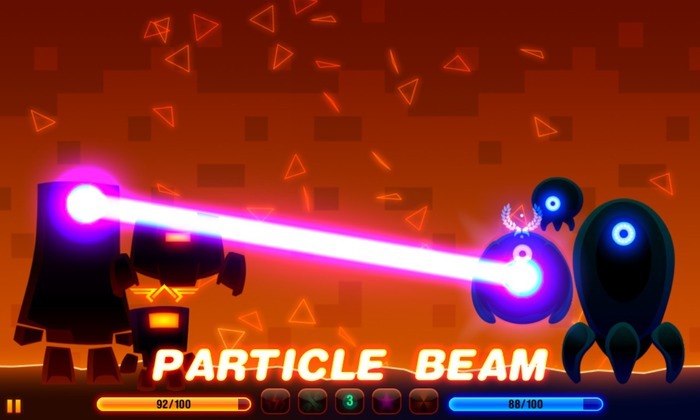 The third and final mode provides an array of devastating attack powers: Beam, Microwave, and System Shock. When you start spinning the symbols on (what I'm describing as) the fruit machine, the more matching symbols you get the stronger the version of the robot of ability you'll gain. If you match all free columns, you'll get an extra turn, which means that if you have extremely good reactions you could dominate the game. Such outcomes are highly unlikely because each column spins faster than the previous. I figured out the knack of getting a set of three, but my reactions are too poor to do it reliably, and I think that will account for most players, and the developer has done a good job of making sure your computer driven opponent isn't too good at timing its plays either. With the Firewall, and all of the robots, rolling matching symbols on later turns serve to repair and (if no repairs are needed) upgrade the object in question. With the three types of rolls on offer, there is an interesting mix of building for a long term game (i.e. building up robots and firewall), or playing defensive moves (i.e. drain and hack), or going for all-out offensive (Beam, Microwave, or System Shock). Much of what you do will be based on weighing your mainframe's health points against that of your enemy's. For example, if you're losing you might want to hunker down and defend, or take the risk of getting a triple strength beam – the ultimate weapon capable of taking 60 health points from a mainframe – and thus level the playing field. Hopefully you get the idea now, it's a little like playing poker, there's some skill and judgement involved, but it fundamentally comes down to the luck of the draw. 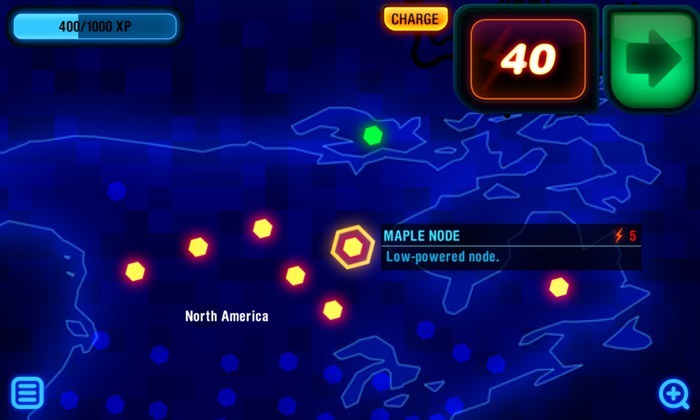 The campaign mode of the game where you are trying to save the world has a massive amount of mainframes to deal with, and many of them are very tough indeed. So you won't be finishing the game any time soon. The campaign isn't all there is though. In addition to the well-designed tutorial mode, there's a multiplayer mode. Where off in the cloud somewhere, there's a real mainframe (!) who will match you against a similar (and anonymous) player. My only complaint with this mode is that it can take quite a while to match you up with someone. Also while you can set a player name, there's no account creation so if you have to wipe your phone (or your PC if you're playing the Windows 8 version), there's no record of your achievements or scores. Even if that was all there was to the game, I for one would be happy. 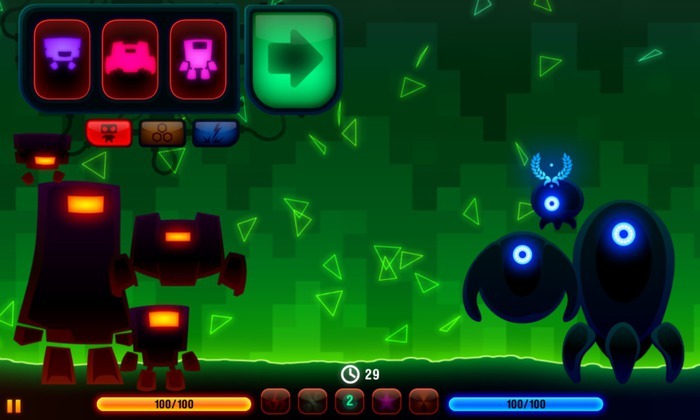 However, there are added gameplay aspects to unlock and discover. 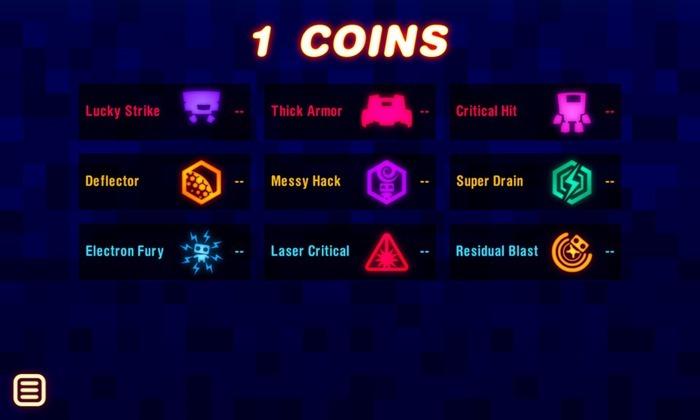 For example, in the tradition of coin-op arcades, you can collect coins that you can put towards various types of abilities (e.g. several variations of scoring a 'critical hit'). There are also other special abilities to earn throughout the game that appear in a small toolbar at the bottom of the screen for you to activate. For example, in your hour of darkness you can light the way by dropping a great big nuke on your opponent, or when things are getting a bit too scrappy for your liking you can activate an emergency repair. Also note that the developer has a handy instruction page. 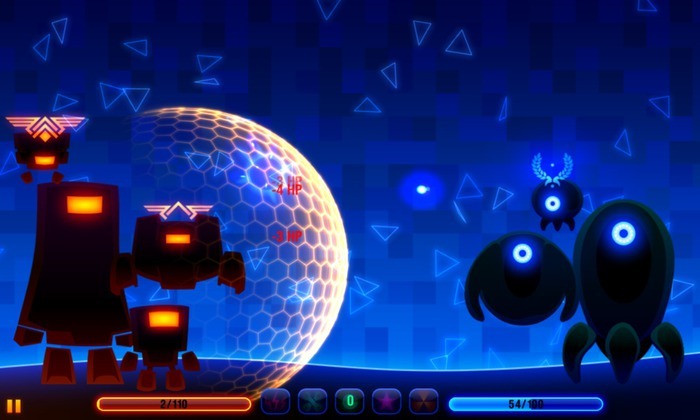 The game graphics are unashamedly robotic and cute. Even though most of the characters are floating instruments of death, I still had an urge to give them a hug – especially when they are critically damaged, as they are just there shivering nervously. Maybe that's just me though! 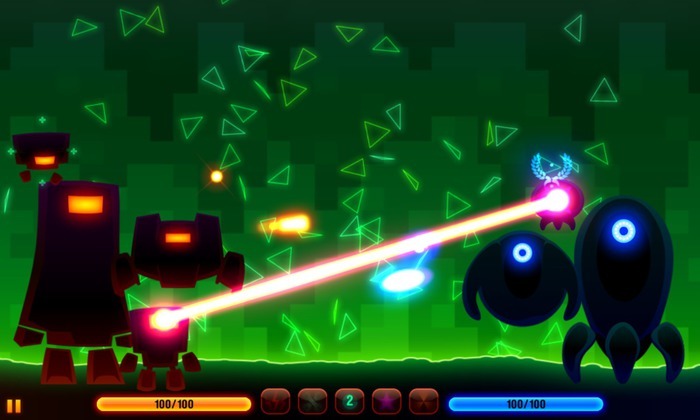 To harken back to the good old days of coin-op machines, all of the graphics are drawn as if they're made of neon lights – everything is in colours that pop and glow. The sounds and music are professional and fun too. With most games I have to disable sound, but not in this case. Best of all, the game is free and not even laden with adverts. The only way the developer seems to be making money is by selling in-app purchases, both of coins and power in the campaign mode, and for humour outfits for your mainframe to wear in multiplayer mode.